Retrogression — as people imprecisely call the visa wait times resulting from oversubscription — is my least favorite EB-5 topic. The problem threatens my market, and I’d love for it to go away. There are two ways to make the retrogression problem go away: solve it or ignore it. Solving retrogression requires convincing Congress to give EB-5 more visa numbers, or to change allocation. More visas = smaller backlogs = shorter wait times. Different allocation = spreading out the backlog impact = shorter wait times for some. But solving retrogression is hard because of Congress, so that leaves ignorance. Ignoring retrogression is easiest if one shrouds it in mystery and doubt. If EB-5 visa availability and wait times seem impossibly complicated and uncertain, then it’s natural to ignore the issue because what else can one do. But that’s not responsible. In fact, retrogression is in the realm of math, not of myth. China is exceptional (the future demand factor introduces need for a crystal ball, and results in variable/unreliable timing forecasts for China), but future EB-5 visa availability and wait times for other countries are calculable. Investors from countries nowhere near demanding 700 EB-5 visas annually need not fear retrogression. For countries that are over (Vietnam) or near (India) the approx. 700 limit, the risk from retrogression can be calculated from the accruing excess over that limit. For India, we have ballpark figures for number of visas already spoken for as of the end of 2018, and know something of priority dates within this backlog. The fixed number of annual visas available to India simplifies the calculation for wait times implied in past and potential future demand. The math isn’t fun – especially when calculating the wait time for a particular priority date, because of course people at different places in line face different waiting times, and variables vary over time. But still, workable estimates can be made based on available data, with areas of variation and uncertainty accounted for with math plus judgment. “We just can’t know, no one can really predict” gave an alibi for China wait times and backlog buildup, but that excuse is not available for India. We can’t know exactly but we can generally predict how long someone investing today from India will need to wait for conditional permanent residence. We can predict the result of looking to India for billions of dollars in EB-5 investment, so long as fewer than 700 EB-5 visas are available per year for India. I put several analysis worksheets into my Backlog Calc file as a starting point. For example, here’s a screenshot of the India Calc tab. 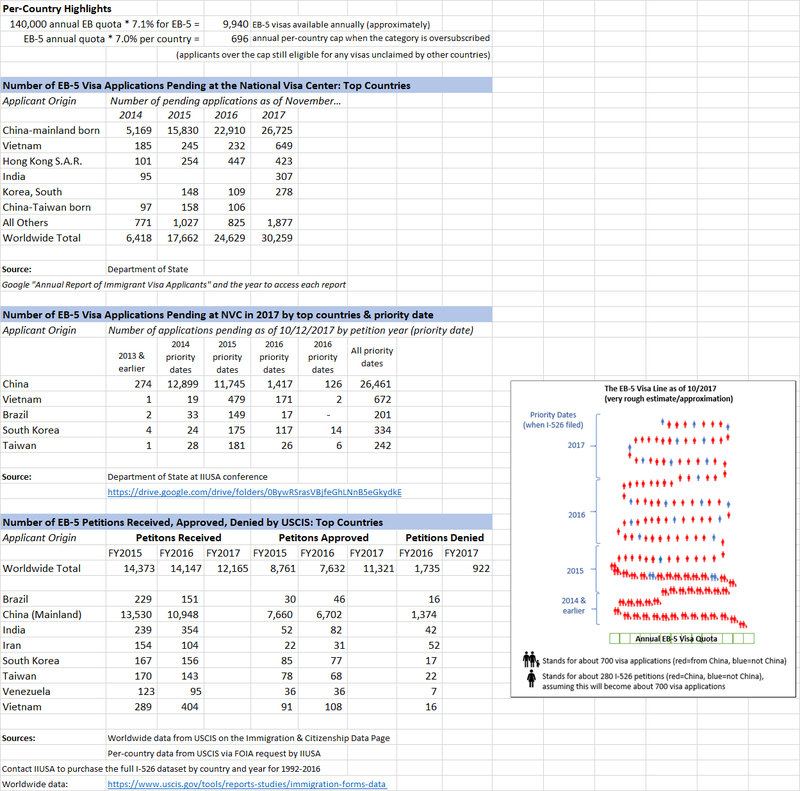 This sheet breaks down the data, assumptions, and equations behind Charles Oppenheim’s estimate for the India backlog and wait time as of Q1 2019, and offers models for calculating scenarios and the impact of future EB-5 capital raises in India. Being in the realm of math, when you doubt a conclusion, you can examine the variables, trace assumptions to underlying data, rethink the equations, and test alternate assumptions. My spreadsheet is your spreadsheet. Download the Excel and play with it on the big screen. Let clients play with it and reach their own conclusions. Just don’t tell prospective EB-5 users “we can’t know, it’s a mystery,” because predictions are possible and necessary. We must try to be realistic about timing, because EB-5 isn’t only about waiting for a visa. It’s about tying up investor capital, and putting issuers on the line to deploy and redeploy capital for as long as it takes investors to get visas. Projects care whether they have to deal with EB-5 investors for 5 years or 10 or 20. Investors care whether their life savings are deployed at risk with negligible interest for 5 years or 10 or 20. And lawmakers need to know if our current EB-5 visa limits soil the past, and gut the present and future economic potential of EB-5. We need “real visa capacity relief,” as IIUSA says in a recent blog post. I’ll be interested to hear more about what specifically IIUSA can and will do toward visa capacity relief, which has historically not been a plank of the advocacy platform. (Not that the industry hasn’t wanted it, but that Congress hasn’t been willing to hear about it.) Certainly, the issue has become central to the long-term health of the EB-5 program. A reader asked me this question a couple weeks ago: Is EB-5 still a choice? Can it be a good option today for project companies or prospective immigrants? The answer: yes, though it’s complicated. In 2018, we felt the sting of legislative, regulatory, and policy uncertainty, and the pressure of limited visa numbers and associated wait times. Limited visas mean that EB-5 is no longer a good choice for the ones who used it most in recent years: China-born immigrants and mega-projects. EB-5 can still work well today on a small scale – for immigrants from not-backlogged countries (or not in a hurry), and for projects that don’t rely on massive EB-5 raises. Uncertainty remains an issue, as regional center program authorization depends on Washington’s ability to pass funding bills, and basic EB-5 program terms are subject to change from new regulations and policy. This post looks back at major developments reported by this blog over the past year. EB-5 itself is permanent, but the regional center program was established in 1992 with an initial five-year term, and has required reauthorization since then. Authorization has typically been attached to appropriations bills — a blessing when the appropriations process goes smoothly, and a curse when it doesn’t. Congress did not intend to harm the RC program in 2018, but drama over government funding meant that the RC program faced five sunsets this year, and temporarily lost authorization twice: with the 3-day government shutdown in January 2018, and with the current shutdown since December 22. The choppy history of RC program authorization is really just the dismal history of appropriations bills and Washington’s struggle to agree on government funding. We spent all of 2018 thinking that DHS was just about to finalize new regulations increasing the EB-5 minimum investment amount and changing TEA rules. The OMB Unified Agenda anticipated a Final Rule by 02/00/2018, and then by 11/00/2018, but neither of those targets were met. USCIS has had since April 2017 to consider public comments on the regulation and come up with a final rule, but the task is complicated. The public generally didn’t like the draft rule, and DHS has had staff turn-over in nearly every position responsible for the EB-5 regulation. USCIS did make four updates in 2018 to the EB-5 section of the USCIS Policy Manual. The updates (1) reaffirmed that USCIS provides documentation of CPR status to those with pending I-829, (2) rescinded previous guidance on tenant occupancy methodology, (3) updated guidance on regional center geographic area requirements, and (4) clarified policy on debt arrangements. USCIS did not issue or promise any new guidance on the most pressing policy grey area: redeployment. Some of us have been talking about EB-5 visa numbers and trying to crunch numbers for wait time estimates since 2015, but 2018 was the year when everyone joined the conversation. In 2018, Department of State lengthened its estimate for the EB-5 visa wait for China-born investors, gave a cut-off date to Vietnam for the first time, and predicted oversubscription for India. EB-5 visa availability and wait time estimates went from being a fringe topic for killjoys with confusing spreadsheets to being a primary and widely-discussed factor in marketing strategy, investment decisions, and litigation. The best attempt in 2018 to alleviate the visa number problem came from a lawsuit pointing out Congress’s expressed original intent to grant 10,000 visas to EB-5 investors, and the error of applying that limit to investors plus family members. So far the judge denied a preliminary injunction in the case, but the plaintiffs are continuing to pursue the matter. Meanwhile, proposed legislation suggested changes to visa number allocations, but not changes that benefited EB-5. Fortunately those proposals did not become law. Demand for EB-5 continued fairly strong in 2018, with about 4,000 I-526 filed from January to October. Of these, about 1,000 were filed in a surge in September 2018, in advance of possible changes/sunset date, and over 850 were filed by people born in India. Overall, I-526 receipts were well below totals from previous years, and should continue to fall as people adjust to the hard limit imposed by the 10,000 annual EB-5 visa quota for investors plus family members. In 2018, IPO got a new chief and (I think?) several new division chiefs, issued four policy manual updates, held no stakeholder engagements until three appearances in November, significantly improved I-526 processing volume and times, dropped the ball on I-829, further confused processing times reports, issued many RFEs on issues related to the “at risk” requirement, and terminated 138 regional centers (mostly for inactivity or not filing Form I-924A). In 2018 I wrote EB-5 business plans for new projects in hospitality, multi-family, retail, assisted living, manufacturing, distribution, and storage, as well as E-2 work. I enjoyed hearing good news from past clients with approved petitions, and tried to help clients struggling with timing issues, redeployment challenges, policy changes, and political uncertainty. This blog had 49 new posts in 2018, and received 407,967 views from 121,349 visitors. Of these visitors, 56 made a contribution to support the blog. I appreciate the people who work hard to make EB-5 work, and especially the clients who have let me be a part of the process. We shall see what 2019 brings. It appears that a Continuing Resolution will extend regional center program authorization at least into December 2018. (I add detail and updates as available to my Washington Updates page.) Assuming business as usual, regional centers should think about preparing to file the Form I-924A annual report. Regional centers use Form I-924A to demonstrate continued eligibility for regional center designation. Regional centers that remain designated for participation in the program as of September 30 of a given year must submit Form I-924A with the required supporting documentation on or before December 29 of that same year. If the regional center has experienced any changes for which an amendment is required (such as changes in name, ownership, or structure), file the I-924 amendment before filing I-924A. Double-check that the regional center entity is still active in good standing, and with an active business license. Remind USCIS with which Secretary of State and municipality the regional center is registered, so USCIS doesn’t check in the wrong place. A compelling counter-argument requires project evidence. In termination letters, USCIS does not admit to being impressed by evidence of marketing and promotional activities for the regional center, by due diligence on potential projects, or by general industry involvement. USCIS most wants to see evidence of projects imminently likely to use EB-5 investment. They seem to want to see project evidence related to timing (such as registrations, licenses, permits) and evidence related to firm commitment to do the project and include the regional center and EB-5 investment (such as signed term sheets, signed purchase agreements, loan commitments). The goal is to avoid USCIS deciding that “the evidence submitted relate only to potential projects and future aspiration goals” and “thus these projects are not relevant examples of the regional center’s ability to continue to promote economic growth” (to quote language repeated in multiple termination letters). USCIS seems particularly fixated on the idea of “binding contractual obligation” and to particularly like finalized contracts and signed term sheets as evidence. (Again this advanced-project evidence demand is hardly reasonable – calling for status and commitments not consistent with the fact that USCIS will likely delay projects with years-long I-526 processing times. But the injustice has yet to be recognized.) There’s some evidence that having filed an amendment (especially one with I-526 exemplar request) can help support the activity argument, in lieu of being able to report filed investor petitions. These regional center termination letters discuss specific examples of project evidence provided to USCIS with Form I-924A, and why USCIS did not think the evidence of activity made for a compelling economic growth argument. If you’d like to advise USCIS about how to make the next edition of Form I-924A less faulty, you have until 11/13/2018 to do so through the Federal Register rulemaking comment process. Benefit from this blog? Please consider supporting the considerable effort behind it. Contributions through this PayPal link go to Lucid Professional Writing (a for-profit business), and help support EB-5 research and reporting into the future. Thank you! We respond to these facts by (1) advocating for backlog relief (AILA’s White Paper: Solutions to the EB-5 Visa Waiting Line gives suggestions), and (2) figuring out how the exceptions work, because investors and projects want to avoid a decade-long wait if possible. The past few years offered a simple exception that allowed jumping much of the queue: be born outside China, since China accounts for most of the backlog and was the only oversubscribed country. Now, people from Vietnam face getting stuck in the visa wait line behind the Chinese (the May 2018 Visa Bulletin will have a Vietnam cut-off date), other countries wonder whether the same could happen to them one day, and Congress threatens set-asides and other changes to visa availability. And so we feel the urgency to understand just how visa allocation works, and relevant numbers. I imagine Charlie Oppenheim at the Department of State, sitting at his desk on October 1, 2017 with 30,000 EB-5 visa applications before him and tens of thousands more to come as USCIS approves pending I-526. How does he apply the above rules to decide who gets a visa in FY2018, and in what order? I hope he addresses this question during his keynote speech at the IIUSA EB-5 Advocacy Conference on April 23. (4/25/18 update: here are notes from Mr. Oppenheim’s presentation. 10/30/18 update: See slide 5 in this presentation, and my recording of a panel on EB-5 visa numbers.) In the meantime, here’s my understanding of how the rules get applied in practice. #1 and #2 above give the target quota for EB-5 visa numbers in one year: 140,000*0.071=9,940. Exceeding the 7% cap is scary because it puts a country in the same line as China for leftover EB-5 visas, and near the back of that line based on priority dates and the FIFO process. The saving grace for small countries is that they can at least get 7% of EB-5 visas every year, and probably won’t exceed that cap by very much. If I’m a Vietnamese applicant held back this year, I’ll be one of the older Vietnamese applications next year and thus well-placed to get one of 700 new EB-5 visas available to Vietnam then. What I can’t expect is to get an EB-5 visa left over after not-oversubscribed-countries took what they want, since tens of thousands of Chinese have earlier claim on any leftover visas. But small excess = small backlog = small need to compete for leftover visas, thus relatively short wait time. As an Indian, I’d be a bit more concerned and vigilant. India hasn’t had high EB-5 numbers before, but the companies that helped create the China backlog with giant EB-5 raises have turned to India. If Indians flock to big raises seeking 100s of investors, then they will end up needing many more than 700 visas per year, thus creating a significant India backlog that needs leftover visas but won’t get them for ages because behind the earlier China/Vietnam backlog plus squeezed by any new rest-of-the-world applications. Visas can only be issued to people with complete visa applications ready, not to people with I-526 investor petitions still pending at USCIS. But it’s important to keep an eye on I-526 petitions – on number of receipts, petitioner origin, adjudication speed, approval rates – to estimate how many of those petitions will become visa applications, and when. New visa applications from not-oversubscribed countries immediately reduce the number of leftover visas available to pending applicants from oversubscribed countries. New applicants from a country near the 7% cap could tip the balance into cut-off dates and backlogs for fellow-countrymen already in line. A major decrease in I-526 filings or increase in denials or withdrawals would reduce incoming pressure on the visa backlog, and shorten wait time projections. Estimates are tough with all these moving parts and limited data, but we must try. The China backlog ballooned quickly and came to many investors (and their projects) as a nasty surprise. They didn’t realize how many other Chinese investors were already in the system or entering at the same time, and what that would imply for future visa wait times. A cautionary tale. To facilitate analyzing numbers relevant to country-specific visa availability, I’ve added a tab titled “Country Focus” to my ongoing Backlog Calc Excel file. (The numbers aren’t new, but highlight significant previously-reported I-526 and pending visa data. I even made a cartoon to assist in visualizing the numbers. The thumbnail image here gives a teaser of the new Excel tab.) I don’t offer conclusions, but information to assist your conclusions. Benefit from this blog? Please consider supporting the effort behind it. As the EB-5 industry changes, your contribution can help preserve this space for conscientious and freely-available EB-5 reporting. 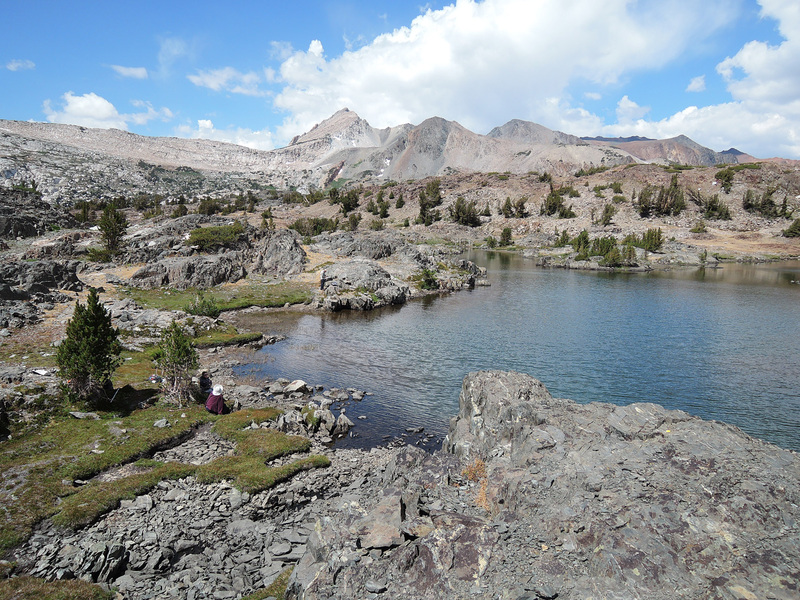 Donations go to Lucid Professional Writing (a for-profit business) to fund work on this blog. Thank you! How long does it take to get an EB-5 visa? Before we look at numbers, consider this picture illustrating variables in the EB-5 process from initial application to conditional permanent residence. The investor files an I-526 and receives a priority date, goes through I-526 adjudication, and proceeds along with family members to I-485 status adjustment (if already in the US) or consular processing (if outside the US) in order to get EB-5 visas. The system has two major constraints: USCIS capacity to process petitions, and the annual quota on EB-5 visa numbers. These constraints have produced pile-ups of pending petitions and applications, illustrated by the green bins in the picture. We have data for many parts of this picture, such as how many people are in each of the pending bins, the historical rate of receipts and approvals and denials, and the annual visa quota. The simplest way to estimate the visa wait line (the time from priority date to green card) is to add up the pending bins and divide that number by the annual quota. As there are currently 90,000+ people associated with the pending bins, and the annual EB-5 visa quota is about 10,000, the current total waiting line is 9+ years long. (Maybe longer, depending on assumptions about the other variables). As recently as mid-2014, the line was only about three years long (as we know from the Visa Bulletin, which indicates that China-born investors with June 2014 priority dates started getting visas in May 2017). Calculating the actual visa wait time for any given person is complicated. Where is that person in line, relative to other pending petitioners and applicants? Is that person from China (which is oversubscribed and subject to a per-country limit) or from an undersubscribed country that’s free to take the first available visas? How have/will other process variables such as per-country receipts and approval rates change over time and affect calculations? If I were someone born outside China considering EB-5 now, I’d feel good about the per-country limit that allows me to skip ahead of most China-born applicants in line (i.e. about 87% of the line). For me, the time IPO takes to process I-526 is the major factor in my total wait time. If I were a China-born prospective investor, I’d look at everyone in line ahead of me, and also try to estimate how many queue-jumping non-Chinese may enter from behind in the time I have to wait. That calculation could add years to the potential wait time, well exceeding 10 years, if the number of non-Chinese investors increases dramatically in the future and IPO processing speeds up. Or future circumstances could quell new EB-5 demand, encourage existing applicants to drop out, or apply the per-country limit to other countries, improving the wait time for China-born investors who stay in the system. All past investors should consider the significance of the visa quota constraint and the possibility that it will change. Indeed, it could change for the better. For example, if the State Department recognizes that Congress intended the 10,000 visa quota to apply to 10,000 investors, not investors plus family members, this would loosen the constraint and cut about six years from the current visa wait time. Unfortunately, quota reduction is also a live possibility. Industry lobbyists are reportedly considering legislation with visa set-asides that would reduce the generally-available annual EB-5 quota from 10,000 to 7,000. This could be disastrous for past EB-5 applicants, adding about four years to the wait time. Visa set-asides have emerged as a compromise between the Senator Grassley camp, which wants to incentivize rural/urban-distressed investment somehow, and certain regional centers, who resist an incentive based on a significant investment differential that would make their future prosperous urban projects uncompetitive. Tying the TEA incentive to visa set-asides rather than reduced investment would allow regional centers to keep attractive terms and options for future investors. Their past investors would suffer, but that cost seems not much counted. (My impression of the current legislation discussion comes from this webinar and this article.) Of course, maybe protections for past investors will be added to the legislation, or maybe there won’t be any deal and we’ll get new regulations instead. The regulations could significantly reduce new EB-5 demand, which would hurt the industry but benefit people who stay in the current visa queue. The regional center program dominates EB-5, but the alternate direct EB-5 track remains significant. 846 EB-5 visas went to direct EB-5 investors plus family in FY2016, and this number will likely climb as petitions from the past couple years finally reach the visa stage. Direct EB-5 can be an attractive option for foreign investors and U.S. business owners who wish to avoid the uncertainty surrounding the regional center program. About half the business plans I write these days are for direct EB-5. There remain, however, lingering misunderstandings about how EB-5 works outside the regional center program. I’ve prepared a new page, Direct EB-5 FAQ, that addresses questions about the nature and practical uses of direct EB-5. Test your direct EB-5 knowledge. True or False? The direct EB-5 program will sunset unless re-authorized by Congress. True or False? A direct EB-5 investor must invest at the $1 million level. True or False? Real estate developments are the most common direct EB-5 project type. True or False? A majority of direct EB-5 investors have come from China. True or False? The direct EB-5 investor must majority-own the enterprise receiving investment. True or False? The direct EB-5 investor must have day-to-day managerial responsibilities in the enterprise receiving investment. True or False? If a direct EB-5 investor buys a business, that business and its employees will qualify as new for EB-5 by virtue of the new ownership. True or False? A new commercial enterprise can use direct EB-5 capital to invest in a separate job-creating enterprise. True or False? A direct EB-5 investor can count full-time equivalent jobs created by the enterprise. Each of these statements is false. If you were surprised, then check out the Direct EB-5 FAQ page for direct EB-5 information, policy references, and case citations. Just in time for Columbus Day, President Trump has sent Congress a list of Immigration Principles & Policies that 15th-century Americans could wish they’d had. The White House principles focus on border security and interior enforcement, and repeat the idea that legal immigration should feature a skills-based points system while reducing admissions for relatives, asylum seekers, and refugees. We shall see how Congress reacts to this guidance from the White House. The White House principles look positive for immigrant investment, but the points system would be fatal (at least in the scenario proposed by Tom Cotton, which would eliminate EB-5 and would not allow immigrant investment to support US entrepreneurs, but only immigrant-controlled business). In the meantime, in honor of voyagers who continue to build our great nation as they bridge continents and pursue their dreams in face of doubt and adversity, I will quote the first paragraph of President Trump’s Columbus Day proclamation. USCIS Ombudsman’s 2017 Annual Report to Congress (June 29, 2017). The EB-5 section of the report (page 30-33) reviews facts we already knew, but is interesting in the way it highlights the EB-5 visa backog as a significant concern. I particularly appreciate the section on the USCIS Administrative Review Process in Employment-Based Decisions (page 23-26), which describes the three alternative administrative options for petitioners who think USCIS has made an erroneous decision: Motion to Reopen, Motion to Reconsider, and appeal to the Administrative Appeals Office (AAO). See especially the very helpful Figure 3.2 on page 25, which lays out the steps and process and considerations in each alternative. The links direct to pages that provide a suggested list and order of contents for each EB-5 form. The regulations and Form Instructions already describe the evidentiary requirements for EB-5 petitions and applications, and these new pages don’t add new requirements. Rather, they provide the content in handy checklist form and suggest a way to standardize submissions by arranging required documents in a predictable order. We keep asking IPO what we can do to help improve the adjudication process and processing times, and this is a very helpful response. Immigration lawyers take note! If we can widely adopt the suggested order of documentation for each form, and most petitions take on a standard shape, with the same tabs in the same order, this will certainly support operational efficiencies at IPO and should help reduce processing times. Julia Harrison flagged this resource at today’s Employment Visa engagement in San Jose. I’ll write another post with more complete report of helpful input from the IPO representatives Julia Harrison and Jan Lyons, Kurt Vicha of FDNS, and Charlie Oppenheim from Department of State. IIUSA announces First-Ever Comparative Analysis Report on EB-5 TEA Policy Reform (April 20, 2017). This very valuable report and mapping tool takes a comprehensive look at the impact the different TEA policy proposals would have on the EB-5 Regional Center program at both a national and state-by-state level. For those of you who downloaded my TEA summary earlier, note that I erred in providing a link to an NMTC mapping tool based on old data. You should look instead at the IIUSA interactive mapping tool, which uses the dataset that would actually be required to determine TEA qualification under new proposals. Regulations: Recall the April 11 deadline if you want to comment on USCIS proposed EB-5 regulations USCIS 2016-0006 and USCIS-2016-0008. So far, 0006 (with proposed TEA and investment amount changes) has 54 comments and 0008 (the advance notice requesting feedback on regional center designation issues) just 11 comments. Wolfsdorf Rosenthal and EB-5 Insights have posts about a new kind of source of funds RFE that requests SOF evidence for people transfering funds on behalf of an EB-5 investor. Carolyn Lee discusses the newly-unveiled regional center compliance audit program. A journalist called to ask me for the story behind the surge of regional center terminations in 2015 and 2016. In case anyone else is interested in this topic, here are the sources I sent him. By the way I work hard to keep my blog Regional Center List complete and consistent with information from USCIS, but the task is not easy and I welcome regional centers to correct my information. This article gives practical advice for managers and investors in EB-5 investment funds. It offers a checklist of warning signs that an EB-5 project may be in trouble, defines a role for a construction monitor/accountant and lists tasks that person should accomplish, describes monitoring systems that should be in place, suggests steps for investors to take if they are not satisfied with monitoring and reporting, and begins to address the question of what EB-5 investors should do in case of a fraud enforcement action. I particularly recommend this article to EB-5 investors, as a reminder of what they can demand and what they should do after investment. EB-5 managers are not necessarily motivated to meet a high and expensive standard for oversight (a manager affiliated with the project owner may not see the need, an unaffiliated manager may prefer to keep at arms length from the project, and the odd bad actor lives on opacity). EB-5 investors, however, certainly benefit from exercising their rights to active and on-going due diligence. People drafting EB-5 legislation and regulations may also be interested in this article, as they consider appropriate requirements for EB-5 managers. This article steps into the grey area that USCIS has left by failing to finalize or replace its DRAFT guidance on the Job Creation Requirement and Sustainment of the Investment for EB-5 Adjudication of Form I-526 and Form I-829 (8/10/1015). At issue is the question of what EB-5 enterprises can do with EB-5 money considering that (1) an EB-5 investor’s funds are required to remain at risk in the enterprise throughout the investor’s conditional residence period, (2) visa backlogs mean that the investor might not be reaching the I-829 stage until up to 10 or more years following the initial investment, and (3) most EB-5 deals involve loans due to be repaid to the enterprise in less than 10 years. The draft guidance memo suggested that “to the extent that all or some portion of the new commercial enterprise’s claim against the job-creating entity is repaid to the new commercial enterprise during the sustainment period, the new commercial enterprise must continue to deploy such repaid capital in an ‘at risk’ activity for the remainder of the sustainment period” and “the capital will not be considered ‘at risk’ if it is merely being held in the new commercial enterprise’s bank account or an escrow account during the sustainment period.” Although this suggestion is questionable, and not final policy, it’s the only indication we have of USCIS’s thinking, and the authors of the above-linked article suggest practical ways to satisfy that standard for sustained investment. The authors explain why investment in publicly-traded or privately-held securities or real estate investment should comply with the “at risk” requirement, and they suggest guidelines for making such investments in a manner that complies with Federal securities laws and state law fiduciary obligations. EB-5 Proposed Regulations: A Missed Opportunity, Next Steps for Reform (Rev. 2/14/17) by NYU Scholar-in-Residence Gary Friedland, Esq. and Professor Jeanne Calderon, Esq. In this article, the authors once again address the sticky issue of EB-5 Targeted Employment Areas from an academic rather than industry perspective. They discuss TEA changes in proposed regulations and proposed legislation with reference to their database of EB-5 projects, which is dominated by the kind of large big-city projects that make poster children for TEA reformers. The EB-5 industry will not join the authors in lamenting that the draconian proposed regulations appear doomed by timing, but it should account for and consider effective response to the evidence that the authors present in support of TEA reform. 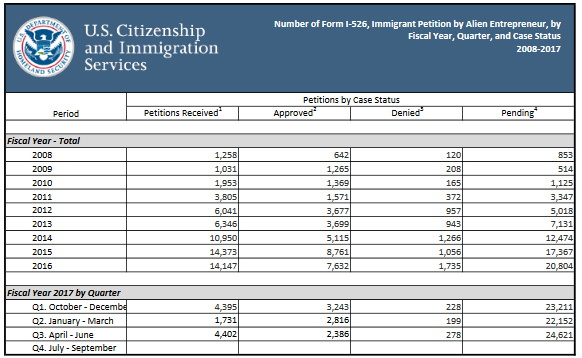 How long does USCIS take to process EB-5 petitions and applications? We have two sources of data relevant to the processing time question: the IPO Processing Time report, which indicates the filing date of petitions currently being processed, and the Forms Data Page, which gives data for the number of received, approved, denied, and pending petitions by quarter. The first source is helpful for past petitioners, while the second source can be better for current/prospective petitioners estimating future processing times. 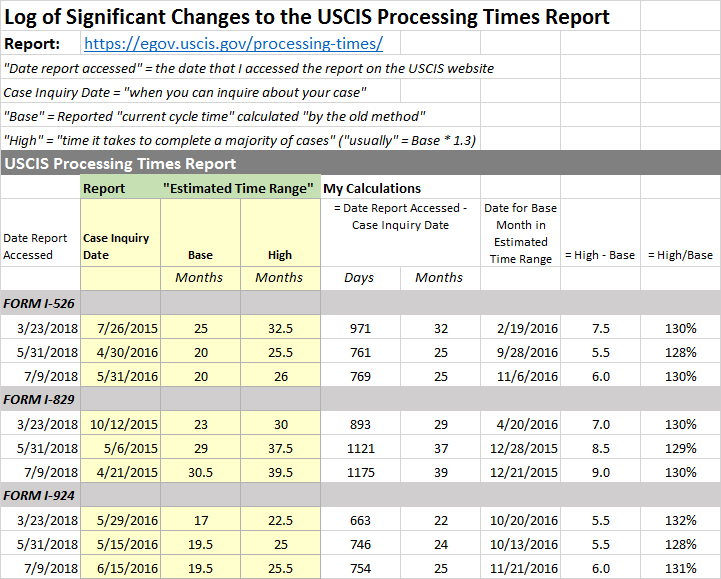 Every month, the USCIS Processing Time Information page updates a chart titled “Average Processing Times for Immigrant Investor Program Office” that looks like this. We post case processing times on our website as a guide for when to inquire (service request) about a pending case. For the last several years, we have posted case processing times using two different formats: For cases that were within our production goals, we listed processing times in weeks or months; For cases that were outside of our production goals, we listed processing times with a specific date. Always refer to your I-797C, Notice of Action, and look for “receipt date” to determine when we accepted your case. If the receipt date on the USCIS Processing Times web page is after the date we have listed on your notice, you should expect to hear from us within 30 days. If after those 30 days, you have not heard from us, you may make an inquiry on your case. We recommend using our e-request tool for all case inquiries. The processing report indicates expected times for past petitioners up to a certain date. (I’ve logged processing times/dates for petitions from 2013 to 2015 in this spreadsheet.) The report does not say anything about the future. Since August 2015, IPO capacity has grown and EB-5 demand has grown even faster. The fact that an August 2015 petition had a 16-month processing time does not promise that a 2016 or 2017 petition will have the same time. This report provides information commonly used in waiting line models: inventory (pending petitions in the system), arrival rate (petitions received) and flow rate (approved + denied petitions, aka completion rate or throughput). For an example of how to use this data to make predictions with a simple waiting line model, see the Prediction tab of my I-526 times spreadsheet. My post EB-5 Timing Issues and Visa Wait: Process and Data discusses the process and wait time between I-526 filing and conditional permanent residence. In the past, EB-5 investor readers have used the comments section of this blog to trade experience with processing dates, and I got a request to open up a discussion forum instead to facilitate this exchange. So I have set up http://eb5.freeforums.net/ as a platform for investors to share experience with and questions about EB-5 petition processing. USCIS has kindly shared IPO Deputy Chief Julia Harrison’s Talking Points IIUSA and AILA Conferences October 2016. There isn’t any breaking news here, but I’ll repeat Ms. Harrison’s first point. “Regional Centers: Don’t forget to file your Form I-924A between October 1 and December 29.” All Regional Centers that were designated as of September 30 this year must file this annual report. Go to the USCIS website for the Form I-924A and Instructions: https://www.uscis.gov/i-924a. Note that there’s a significantly revised version this year, so don’t reuse last year’s form. USCIS gives additional guidance for completing the form in I-924A Filing Tips (2015) and I-924A Q&A (2011). The deadline for I-924A filing this year is December 29, but plan to file by December 22 if you want to avoid the new $3,035 filing fee. Remember that I-924A stakes are high. This form is at the center of an annual review in which USCIS reassesses whether each RC can keep its designation. In preparing to file, consider what we know about the review process. Form I-924A goes to the IPO Compliance Unit at USCIS, which takes the following steps. IPO investigates the RC’s online presence (the RC’s website, online content from agents and promoters) and looks for any impropriety. IPO particularly looks for use of the DHS seal or USCIS signature; any claims about guaranteed returns, guaranteed approvals, or expedited treatment of petitions; and any language (including entity names) that implies a special relationship with USCIS, DHS, or the US government. Keep in mind Cautions on Names of Regional Centers and Enterprises, and Unauthorized Use of DHS Seal. IPO will issue a Notice of Intent to Terminate if the RC fails to submit required information, or if IPO determines based on its I-924A review that the RC no longer serves the purpose of promoting economic growth, and no longer remains eligible for designation. 70 RC have been terminated so far (54 in 2015/2016 alone), so this is not an idle threat.